Electromagnetic Hyper-Sensitivity and Nocebo: What was first – “the chicken or the egg”? In ‘nocebo’ hypothesis it is being argued that people first become aware, e.g. from news and social media, of the possible health risks of EMF-emitting devices and the worries about the possible health risk lead to develop symptoms, they attribute to EMF exposures. Meaning, as first comes awareness of health risks of EMF, and it is followed, as second, by development of EHS symptoms. Such, order of “appearance”, leads to the argument that EHS is a psychological or even psychiatric ailment, having nothing to do with EMF radiation exposure. People suffer but they wrongly associate their suffering with EMF. This is the dominating view-point of ICNIRP and its “subsidiary”, the WHO EMF Project. In my recent posts from the BioEM2015 meeting in Asilomar, CA, USA, I argued that the nocebo effect does not disprove the existence of EHS and that the to-date executed and available EHS research is useless for making any decisions about the existence, or non-existence, of the causality link between EHS and EMF exposures. Recently published study (Bioelectromagnetics, DOI: 10.1002/bem.21937) from France appears to support my opinion – nocebo hypothesis is incorrect. 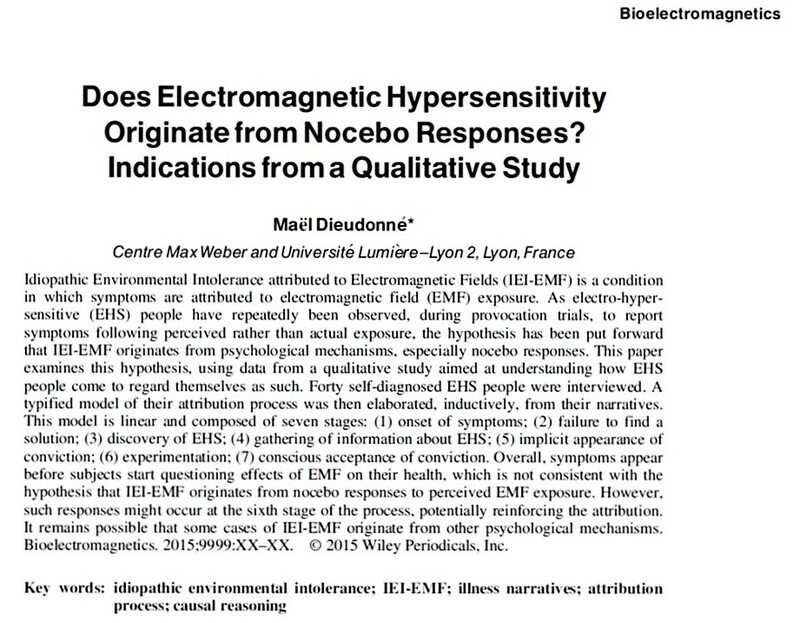 This interesting study by Maël Dieudonné from the Institut des Sciences de l’Homme, Centre Max Weber, Lyon, France, asks ‘Does Electromagnetic Hypersensitivity Originate from Nocebo Responses?’. The answer is – no. It appears that people first get health symptoms and, looking for the cause, find out that EMF exposures might be the triggering event. It is a self-diagnosis, ant that is why it is only an anecdotal evidence of causality. However, this study dismisses a notion that the EHS would be purely psychological/psychiatric ailment, caused by just worries about EMF exposures. …where there are a few stages between the onset of symptoms and the appearance of conviction that EMF might be the cause. Clearly, study by Maël Dieudonné contradicts the ‘nocebo’ hypothesis, propagated by ICNIRP and WHO. To me, it indicates an urgent need to do reliable EHS studies by gathering objective, instead of subjective “how do you feel”, data. We live in the news and social media world where, whether we like it or not, whether we are interested or not, we get to know that something like EHS is being argued about and this may, consciously or subconsciously, affect our perceptions. This, in turn, causes that it is nearly impossible to reliably prove what came first, the EMF worries or the EHS symptoms… what was first, “the chicken or the egg”? I must reiterate yet again that the to date performed studies of EHS, where people are asked how and what they feel (e.g. these by: James Rubin, Rodney Croft, Gunhild Oftedal, Martin Röösli or Maël Dieudonné), will never resolve the issue of EHS and EMF causality because they rely only on absolutely subjective data. In none of these studies objective scientific data is obtained and used to either prove or to disprove causality link between EHS and EMF. Such research approach might be good for social studies but it is not sufficient when looking for the cause of illness with physiological manifestations. As I argue, for already many years and seemingly to no avail, without experimental studies examining physiological and biochemical reactions of human tissues and organs to exposure to the low-intensity EMF, we will continue to gather subjective information that is only an anecdotal but not scientific evidence. It is as if diagnosing heart disease based solely on what patient says, without making any medical examinations and tests… Without biochemical studies we will continue to argue, as children do, “yes, no, may be so” and the same again and again …ad nauseam. This entry was posted in Mobile phones and health and tagged EHS, electromagnetic hyper-sensitivity, Gunhild Oftedal, ICNIRP, James Rubin, Maël Dieudonné, Martin Röösli, nocebo, Rodney Croft, WHO by dariuszleszczynski. Bookmark the permalink.